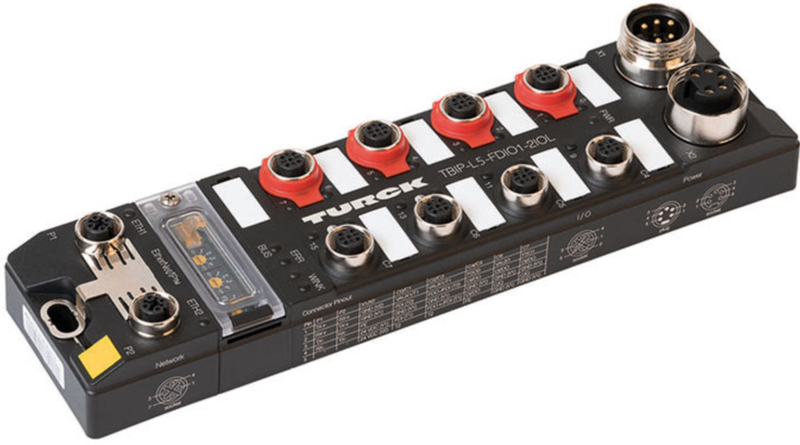 TURCK’s IO-Link portfolio has again expanded with the addition of the FEN20-4IOL that offers 4 IO-Link channels. In addition to the device functioning as an IO-Link master, each of the IO-Link (C/Q) pins can optionally be configured as digital input or output. Benefits of an IO-Link variant include more streamlined configuration, device monitoring, and simpler device replacement. The compact FEN20 with IO-Link is ideal for a wide range of industries, including manufacturing where space is at a premium, on robot end-effectors where small I/O is needed and in automotive manufacturing and Tier 1 plants. the FLC function provides the processing requirement on the parent control system. Configuration and programming are carried out via the ARGEE web-based engineering system. Thanks to the multiprotocol plug-and-play functionality, the FEN20 devices are immediately ready for use in PROFINET®, Modbus® TCP or EtherNet/IPTM systems. The device detects the protocol used by listening to the communication traffic during the startup phase. The FEN20 device measures just 55x62.5x30 mm, and fits in small control boxes, control panels or other existing housings. The FEN20-4IOL is equipped with an integrated EtherNet Switch and a built-in web server to display diagnostic information, and provide access to device configuration parameters. The web page was created to offer a responsive design so that even a smartphone can be used for simple diagnostics. not only withstand harsh environmental conditions such as humidity and dirt – the devices also reliably output a position signal during vibrations and shocks of up to 200 g. These non-contact linear position sensors are also available for a wide range of applications. The sampling rate of 5 kHz reduces tracking errors to a minimum. The resolution has also been further increased with a 16-bit D/A converter. produced during this application do not adhere to the position sensor and do not cause any linearity errors. Thanks to their shock resistance, positions in all types of presses and punches can be easily detected at any time, but also in woodworking or plastic injection molding machines. The Li-Q25L linear position sensors produce two output signals in the same device in both 0...10 V as well as in 4...20 mA. This reduces the number of device variants needed in stock. Turck offers these sensors in measuring lengths from 100 to 2000 mm. To further diversify our ultrasonic sensor portfolio, Turck has released a compact ultrasonic sensor with IO-Link technology. The cost-effective design of this sensor still offers the advantages of a standard ultrasonic sensor as well as communication and advanced functions via IO-Link (Version 1.1). The new device can be taught as a standard sensor via teach-by-wire or programmed and used via IO-Link. Advanced functions such as synchronization allows multiple sensors to be synchronized together without the risk of interfering with each other. When used in this mode, all sensors will transmit and receive information together, which increases the coverage area and provides a single output from multiple sensors. Additionally, multiplexing mode allows several sensors to be mounted close together without interference while providing individual outputs. These sensors are offered in front and side sensing models, rated to IP67, and available with M18 threaded barrel housings and M12x1 Eurofast connectors. Turck is expanding its Deutsch offering with the LED 12 VDC and 24 VDC 2-pin style Deutsch DT overmolded connectors. Designed for the mobile equipment industry, the connectors feature an integrated LED circuit on the wedgelock, allowing for multi-direction troubleshooting indication. Rugged contact design ensures longevity in demanding environments, while the overmolded design, TPE jacket, and IP67 rating provide additional reinforcement, abrasion, and oil resistance in a ready-to-use solution. Turck has also released the first of a new series of DTM Deutsch overmolded connectors. The newly designed 3-pin offering provides an ideal solution for mobile equipment and oil and gas applications, where environmental factors such as shock, vibration, cold temperatures, moisture, and oils can affect performance. The DTM series features the same environmentally robust advantage of the DT connector series, but is intended for smaller wire gauge and lower current applications. 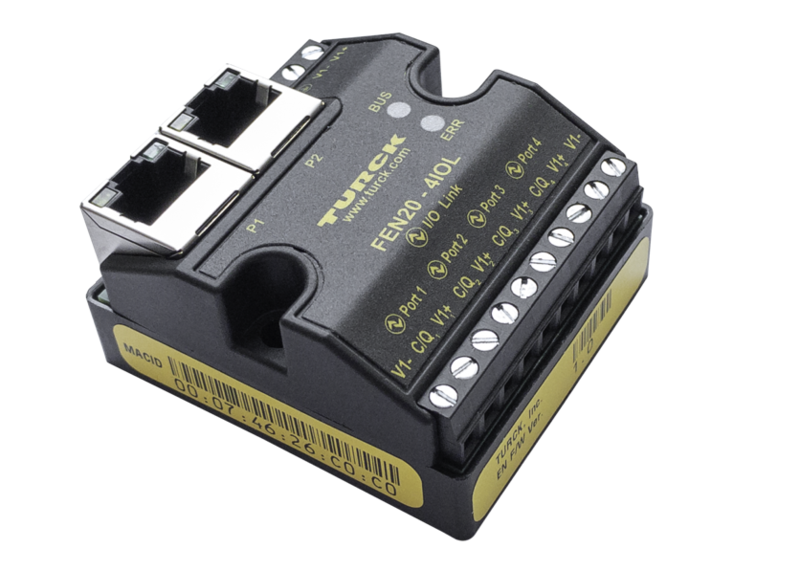 Turck is pleased to announce the addition of the Hybrid Safety Block I/O Module for CIP Safety over EtherNet/IP to our industry leading lineup of fieldbus technology products. The hybrid safety concept from Turck combines both safety I/O and general purpose I/O in a single, rugged, on-machine, remote I/O device. The CIP Safety (TBIP) module expands the existing hybrid safety offering, which already includes an option for PROFIsafe over PROFINET. These devices can be used as remote safety I/O, or even operated as a standalone safety controller for local safe I/O; this allows the implementation of safety functions without the need for a safety PLC while still providing safety diagnostics and general purpose I/O data to a higher level non-safety PLC. The high IP65/IP67/IP69K degrees of protection allow use in the most demanding environments. Decentralized plants and modular machine concepts can be implemented without the need for additional control cabinets.